East of Galveston is the small community called High Island. It is not an island, but sits on a “salt dome”, 38 feet above sea level. (This is the highest point above sea level on the Gulf Coast from Mobile, Alabama, to the Yucatan.) The Houston Audubon Society operates a bird sanctuary within the community, and is a popular destination for birders and birdwatchers from all over the world. Within the Smith Oaks Sanctuary, is Claybottom Pond – home to a bird rookery. 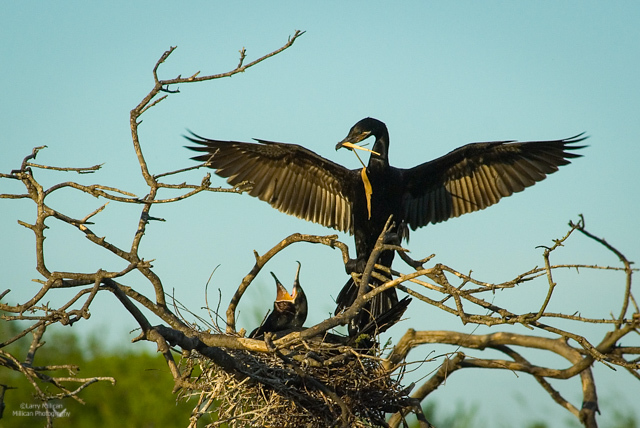 Species nesting there include Cormorants, Night Herons, Tri-colored herons, Roseate spoonbills, and more. The rookery is on a small island at a perfect distance for photographing and watching the birds. If you want to know more about the rookery, and all of the High Island Sanctuary, here is a link to Houston Audubon’s site. Today’s photograph was made late in the afternoon, with the sun behind us. This pair was early in the nest building stage, as most of the other birds were well into the season, with eggs laid already. The male came flying in with nesting material (tree branches and sticks) to add to the structure, and as he landed and gave the stick to his mate, his wing spread in a gesture that appeared to be protective, supportive, warm, and nurturing. I was using a Sony Alpha 100 DSLR Camera, with a Tamron 300mm f/2.8 lens and a matching 2x teleconverter, making the lens 600 mm. Shutter speed was 1/800, ISO 200, and aperture of f/8. Today, I would not hesitate to shoot at an ISO of 800, maybe higher, resulting in a much faster shutter speed. The photo would be sharper… but, the point of the image, its mood, and the story, still is clear, and speaks of companionship, teamwork, family, and love. This photo, #5 in this series, is about capturing a moment, and sharing a story, regardless of technical perfection. The original image suffers from camera movement blur. Today, we can edit the photo in Photoshop, and apply shake reduction sharpening, and at the least, improve the sharpness of the image. And, that was done with this photo. But, was it necessary? Does it now tell a better story? I believe photography is about capturing a moment, about telling a story, and sharing that moment and the story. If the story is clear, and if you see the moment, and if you feel the passion of the photographer, does that not make it a good photograph? Would like to hear your opinion! Until next time … wishing you good light! 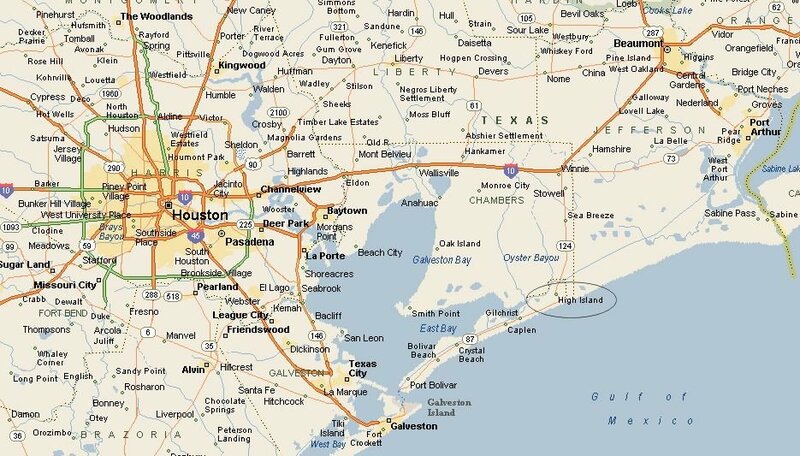 About 30 miles east of Galveston is the small town of High Island. Although it is a small community, birders the world over know the name. 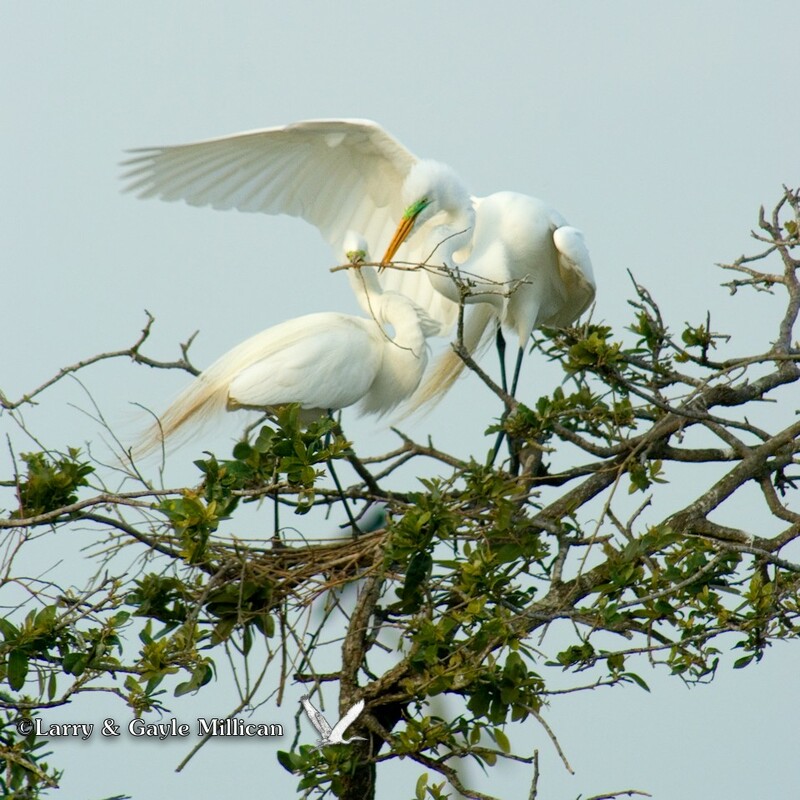 The Houston Audubon Society has converted a large portion of the town into a sanctuary, with wooded areas, and a heron rookery, and each spring, the area fills with migrating songbirds. The High Island Sanctuaries are a definite visit when we travel to the area. 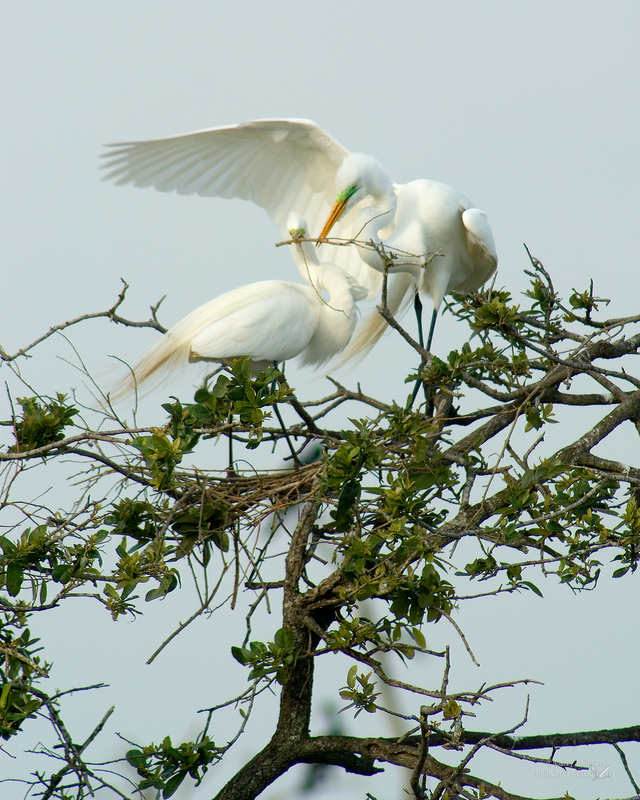 In April, the rookery fills with Great Egrets, along with cormorants, eye-catching roseate spoonbills, and tri-colored and night herons, mating and building nests. For birders and especially photographers, the good news is the rookery is on an island about 20 yards from the pond banks. 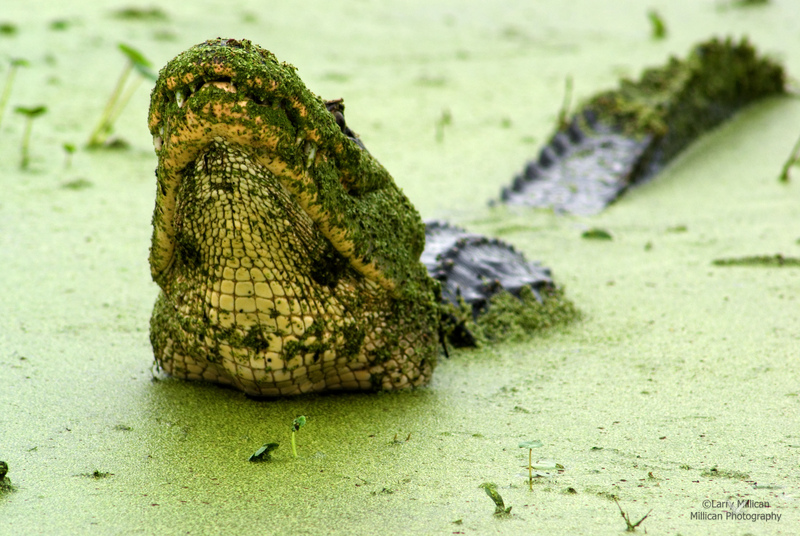 The pond, called “Claybottom Pond” is filled with alligators, making the island safe from predators such as raccoons; but of course, if any birds get too close, they make a meal for a hungry alligator!